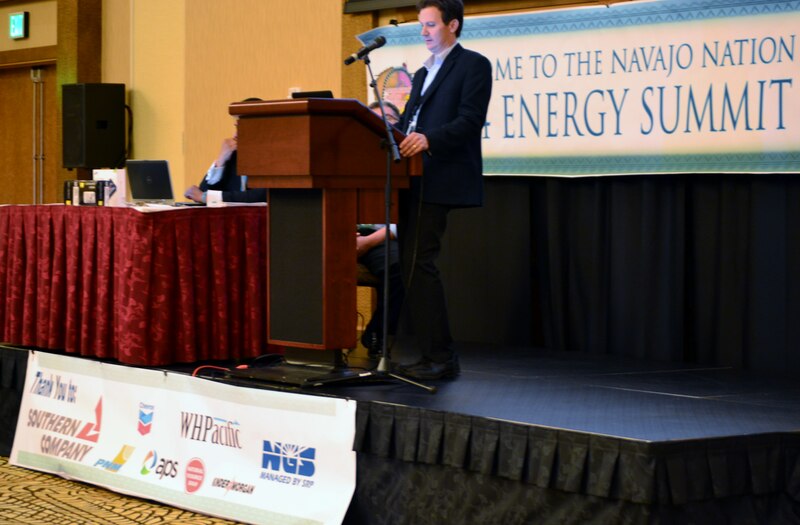 Here at Navajo Division of Natural Resources Energy Summit at Twin Arrows Casino & Resort, which is July 23 and 24, 2014.
white House council on native american affairs, established by President Obama to promote sustainable economic development with focus on energy to drive economic growth. at tribal nations conference, obama decided to ask interior and energy dept to create energy subgroup and working with EPA and agriculture. subgroup starting to get strong legs. several goals in several categories. power point available. first goal related to community scale and utility scale, cuz not large gneration but community scale so in concert with federal clean up initiatives. goal 2, leverage and align federal programs, resources, funding an dassistance to increase all of the above energy development in Indian Country. goal 3, like President Shelly said we are trying to streamline grant and regulatory approval processes. goal 5, work with tribel entities and relevant agencies to advance on the ground energy related projects, focusingin aprtiuclar on projects that cud be replicated by other tribes or parties. in doing so, prmote environmental health and safety practices in connections with such projecjts. gaol 6, ID and suromote finaicla tools and access to capital to support Indian energy development, including potentila finacial incentives to facilitea diret tribal ownershiup. ownership important to mention here, 24.3 percent benefit of US. Salt River Project owns and operates 21.7 percent. how did NGS happen? Colorado River Basin Project Act of 1968 authorized NGS because it prevented any more dams to be built for power. many studies on NGS and most recent 2012 and 2013 regarding positive economic development, benefits to hopi tribe from coal royaltities. but LA Dept of water and power required to divest from NGS by 2013. NGS renegotiated and expires in 2019 so why 25 years extension for US to approve EIS and that is ongoing. but 25 year extension needs an EIS and record of decision that wud supporting renewal of lease. time frame of EIS to look at all impacts resulting from continued operation and alternatives. right now we are on public scoping and we are in process of reopening of public comment which would extend to end of August 2014. then develop draft EIS and take to summer 2016 and get to record of decision Fall 2022.
third impact is EPA Best Available Retrofit Technology. EPA proposed BART had standard, better than BART and EPA established way for others to establish better than BART with SCR and cost of more than $500 million. a alternative development and to EPA Jly 26, 2013 and EPA isued supplemental rule with much of TWG. public comment closed January 2013. Final rule issued summer 2014. TWG is 80 pages and main is 20 pages, have more appendices than main body. definitions sections, better than BART alternatives, carbon reduction and clean erergy, join fedreal agency statement and National enegy lab study. We are also working with non governmental organizations. Indian country has been studied to death and we have organized data base. we hve large data base of feasibility plans funded by federal department of energy and private groups to develop strategies. we have agreement with federal energy department to fund national renewable energy lab with million half dollars and bring national renewable energy lab to work with different stakeholders to meet objectives of ID alternatives that involves renewable energy suitablity to pump CAP. NGS very important to Arizona. we are also looking at funding clean energy. heard attorney general tsosie talked about arteries that deliver energy to az valley and we understand that. there are many resources attached to this system. 1998 met with tribal water department and they pushed across table and asked to fund. why billion, why not $500 billion so we had to educate ourselves and share details about our agency and worked on strategic plan to develop water all navajo nation. we learned about challenges of water haulers. energy development tied to water. we looked extensively at data and beginning to udnerstand where energy corridors cud be created to advbance tribal energy policy. advancing solar energy research is also included. being able to look at rez locations that are close to being ready for development which is near NGS and areas that cud be developed for solar and drive costs down and allow us to interact as partners. many of these across navajo – wind, solar, natural gas – lay potential for energy dvelopment for power for schools and hospitals on rez. provide clean energy development. opportunites exist to enhance our working relatoinship, resource strategic planning, project development.